Add another book for possible holiday gifts: Oprah Winfrey's latest 2.0 selection. 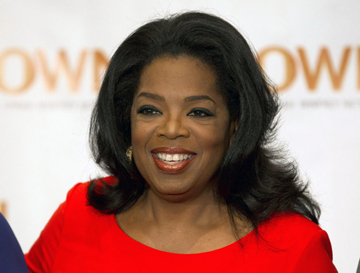 Winfrey announced that she has chosen Ayana Mathis' debut novel, "The Twelve Tribes of Hattie," for her book club. Publisher Alfred A. Knopf moved up publication from early next year to this week, and an author interview will be aired Feb. 3 on the "Super Soul Sunday" program on Winfrey's OWN network. "Twelve Tribes" is the story of a teenager's journey from Mississippi to Philadelphia in the 1920s and the large family she ends up raising. "The opening pages of Ayana's debut took my breath away," Winfrey said in a statement. "I can't remember when I read anything that moved me in quite this way, besides the work of Toni Morrison." Winfrey revived her club, now called Oprah's Book Club 2.0, this year with Cheryl Strayed's memoir "Wild." Winfrey's clout, along with her ratings, might have dropped from a decade ago, but she is still a major commercial force in the book world. Also published by Knopf, "Wild" has sold around 500,000 copies, most of that coming after Winfrey's announcement. Dozens of books over the past 20 years have become best-sellers, thanks to the talk-show host's endorsements.